Roger of Newburgh was the second Earl of Warwick after the Norman Conquest, and took over the lordship of the Manor of Sutton Coldfield in 1126. Earl Roger made frequent journeys to the Holy Land and struggled to survive the civil wars of Stephen and Matilda. He was succeeded in 1153 by his son William who was loyal to Henry II. In 1184 William met his death in the Christian kingdom of Jerusalem where he had gone to give military support to King Baldwin, and his 31-year-old younger brother Waleran became the fourth Earl of Warwick. Waleran was plagued by the attempts to displace him of an impostor who claimed to be his elder brother returned from Jerusalem. The fact that he paid a fine to escape military service in Wales suggests that he was not a career soldier, but he held high office at court - on May 27th 1199, at the coronation of King John, he was the bearer of the ceremonial Sword of State. Waleran died in 1204. 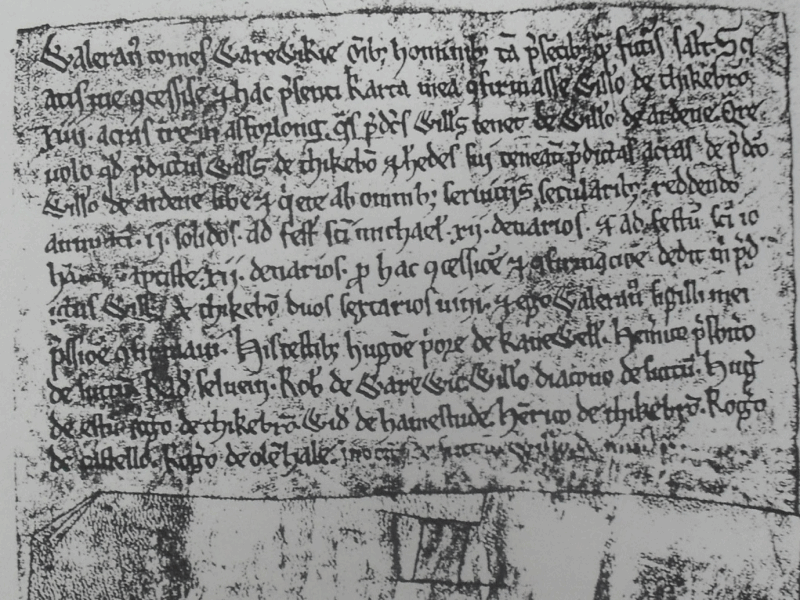 The earliest surviving documents relating to the manorial administration of Sutton date from the period of Waleran’s earldom. Birmingham Reference Library Manuscript 347958 dates from around 1200, and shows Waleran dealing with local Sutton matters, probably on a visit to his manor house here. It begins (in Latin) “Waleranus comes Warewikie omnibus hominibus tam presentibus quam futuris Salutem. Sciatis me concessisse et hac presenti Karta mea confirmasse Willielmo de Thikebroom xiiii acras terre in Ashforlong”, literally translated as “Waleran Earl of Warwick to all men both now and in the future sends greetings. Know me to have granted and by this present charter of mine to have confirmed to William of Thickbroom fourteen acres of land in Ashfurlong”. The deed goes on to say that Thickbroom already holds the land as tenant of William of Arden, knight, but in future he can have it in return for an annual rent of two shillings payable to Sir William instead holding the land in return for feudal services. Waleran’s fee for making this grant was two bottles of wine. The exact location of these fourteen acres is difficult to determine. The “furlong” element in the name Ashfurlong appears to relate to the Anglo-Saxon Open Field system, where an open field would be made up of a large number of strips of land each being a furlong (220 yards) in length: Ashfurlong was perhaps the name of an open field extending over the present Rectory Park and School Farm estate. However by the twelfth century the name was applied to a whole district of Sutton extending from Tamworth Road to Penns Lane and the fourteen acres were probably somewhere near Falcon Lodge. Sir William de Arden held Curdworth and Pedimoor, Thickbroom was a manor near Weeford, and this fourteen-acre field lay somewhere half-way between them.